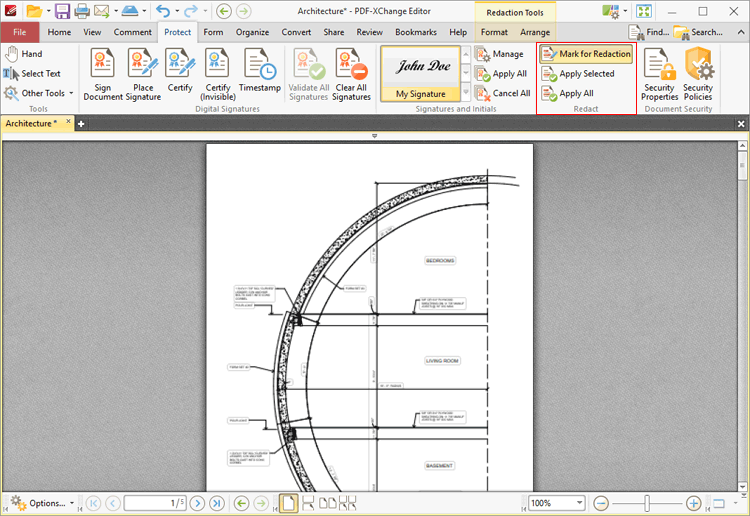 •Use the control points to resize areas. •Use the editing aids detailed here to assist in the precise placement of areas marked for redaction. •Click and drag areas to reposition them. •Click Apply All to redact all areas marked for redaction. •Click Apply Selected to redact only selected areas. (The Select Comments Tool can be used to select multiple areas). •See here for an explanation of the remaining options. 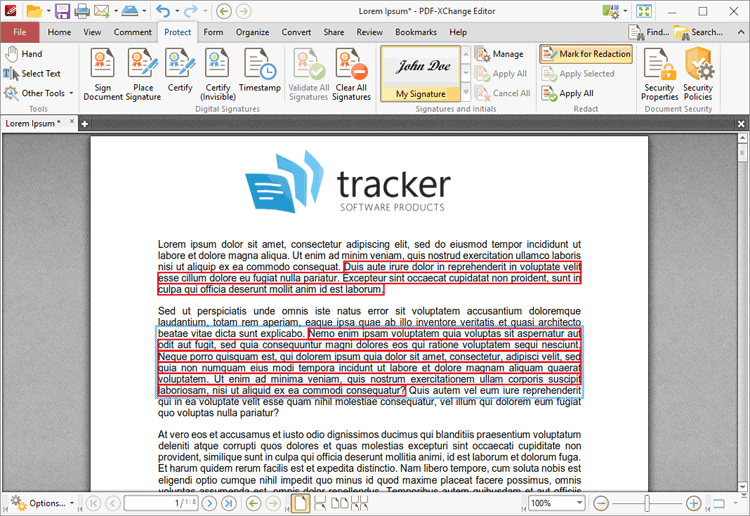 •Use the Fill Color dropdown menu to determine the color of areas marked for redaction. 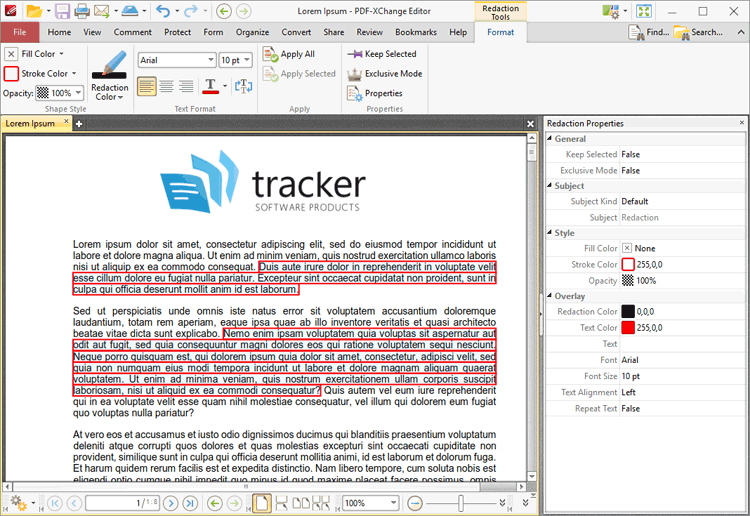 •Use the Stroke Color dropdown menu to determine the border color of areas marked for redaction. •Use the Opacity dropdown menu to determine the level of transparency in areas marked for redaction. 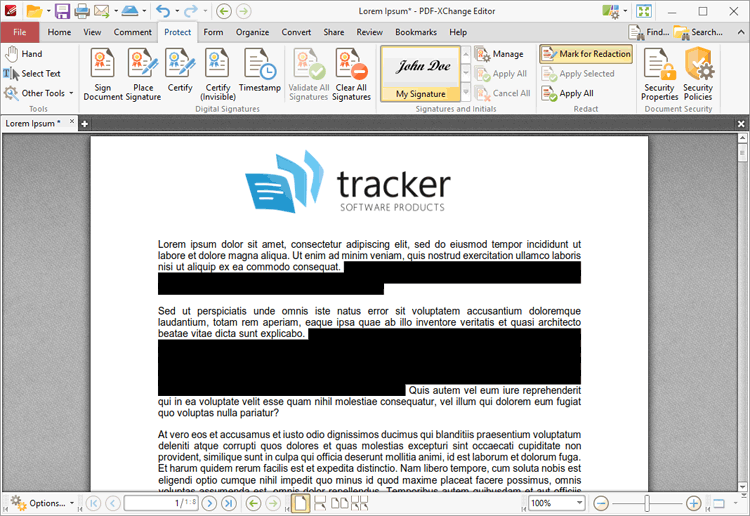 •Exclusive Mode simplifies the process of using the Redaction feature. When Exclusive Mode is enabled, the pointer ignores all interactive elements of documents other than base content. This makes it possible to mark areas for redaction without the risk of accidentally selecting undesired items. When Exclusive Mode is disabled, the pointer recognizes and interacts with all underlying elements in the usual manner. •Use the Redaction Color dropdown menu to determine the color of redacted areas. •Use the Text Color dropdown menu to determine the color of text used to overlay redacted areas when the text option is enabled. Use the Text property in the Redaction Properties pane to specify the text used. •Use the Font combo box to determine the font used when the Text property is being used. •Use the Font Size combo box to determine the font size when the Text property is being used. •Use the Align options determine the alignment of text when the Text property is being used. •Enable the Repeat Overlay Text option to repeats the text used within redacted areas when the Text property is being used. •Click Apply All to apply all redactions marked in the current document. •Click Properties to view/edit the Redaction Properties pane, as detailed in (figure 4). Click to edit properties. Note that the options in the Overlay section apply to completed redactions.